L R S SALES presents real "S A L E S"
I recommend visiting JESUS-IS-LORD.COM for many resources including the King James Bible in its purest Cambridge edition printable PDF format text for downloading and using in a personally bound form or three ring binder for convenience. Many publishers have tampered with the text so you can have your own free and pure bible. Which Spanish Bible can you trust completely? Jesus is coming for the Bride - IMMINENCE is paramount! THIRD PARTY? STEAL ELECTION? WHAT? The Scriptures - Its Mystery, History, Preservation Etc. YOUR LIFE - ARE YOU A GOOD STEWARD? EXPOSES ON OIL, THE ENVIRONMENT ETC. Yes! There is always HOPE! The Lancaster Baptist Church - Large but Scripturally based! LRS candidly provides here some sobering observations about the present world financial conditions and current monetary and economic crises. Companies and organizations are going to have an unprecedented challenge of dealing with a completely uncharted economic map that leads to a reset of the banking rules and new currencies. The forces at work are monumental and far reaching as a catalyst for promoting a new world order. The potential for currency collapse resulting in new monetary systems and policies are very real. The replacement currencies and banking structures are the tools of political change for a global unification under a common government and economic system. The ancient prophets predicted this and so did a modern American President in our era, George H. W. Bush and his son that followed in the new 21st century, George W. Bush. They both spoke of a “new world order” and a “new order of the ages”. As secret society members of the Skull and Bones society, an occult brotherhood of power and global vision, both Bush men had been prepared and indoctrinated with their sense of destiny to contribute to the ultimate goal of an enlightened democracy creating a State controlled version of capitalism blended with global socialism. This new system would be ruled by an elite class of people with the power economically and politically. Fascism did not die with WW II but morphed into a new variation of a central controlling government beauracracy of all critical elements of the economy as well as the military. This global governance would control all functions of the new world order by an oligarchy of a powerful group of men with their regional political hierarchies through a network of financial integration producing a stranglehold on the world systems of banking, money and trade. The implications are staggering and involve surviving this cataclysmic change. There are real concerns for your enterprise or organization's transition into this new order. Business as usual is over... and even dangerous in managing these forces. This is not just an economic correction or recession. This global environment is very different. Radically different…and radical shifts are occurring. Banking and Monetary policies are inadequate to provide the remedies to stave off the collapse that is gaining momentum. Much more pain is likely for the immediate term and beyond. Depression, deflation, currency collapse and hyper inflation are all terms we will become much more acquainted with in the months ahead. We are prepared to help you, your family and your organization navigate through these turbulent waters of profound change. Liquidity and credit availability are inadequate even with all of the money injected by Central banks. Twelve trillion dollars in investment wealthwas erased in 2009 just in the US real estate and stock markets. The injection of money into the system was less than 25% of that amount so the slide continues and will cause more injections to continually be required. The question is; “will it be enough and fast enough to avoid the breaking point? The critical oil industry is next to go through gut wrenching change. The economic engine that this represents to Western nations and the BRICS is indispensable. Many other businesses rely on oil and the related auto industry. A meltdown here could be the “final straw”. Europe, Latin America, Russia and portions of Asia are in even worse shape as they approach the brink of insolvency and banking collapse. Massive unemployment already grips these areas. The USA's problems may push them over the edge because of the interconnectedness of our financial systems. Downsizing your business model is essential and LRS has experienced this before. Doing the tough things in a timely manner is critical…and doing it with prudence, wise transitional strategies and executing it with compassion for displaced workers and executives. Lean machine organizations will make the cut in this “war of attrition” economically and those that come through on the other side of this profound change will be the benefactors of the new paradigm that will emerge. Whether we like it or not, a new world order is coming. The question is, will you and your company or organization be a thriving survivor, participant? Or a casualty? The dinosaurs became extinct when cataclysmic change occurred. Adapting is a necessary ingredient to your future. We can help. Not really...a satanic counterfeit one is already here. You can stake your life on this fact! Henry Wallace, the Vice President that served in the latter part of Franklin Delano Roosevelt's administration convinced the President while he was still his Secretary of Agriculture (and later Commerce) to use the above new design for the Great Seal of the United States of America to represent FDR's new deal program. 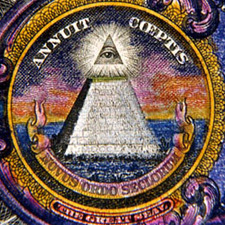 "Novus Ordo Seclorum" is the Latin expression for a "New World Order of the Ages" or The New Secular Order". It reveals that Wallace had occult leanings from his religious and philosophical beliefs acquired from his association with the Russian mystic and occultist, Nicholas Roerich. Copyright Lance Robert Schmidt - LRS Sales & Marketing - All rights reserved.